The Intransa family of products deliver the best possible platform for easy to deploy video surveillance. The ServerBlade series is designed for optimal use with other Intransa products for a complete physical security solution that fits your business needs. The ServerBlade series is a modular server system which comes in a 1U 3 node, 2U 6 node and a market-leading 3U 12 node configuration in a single rack mount platform. 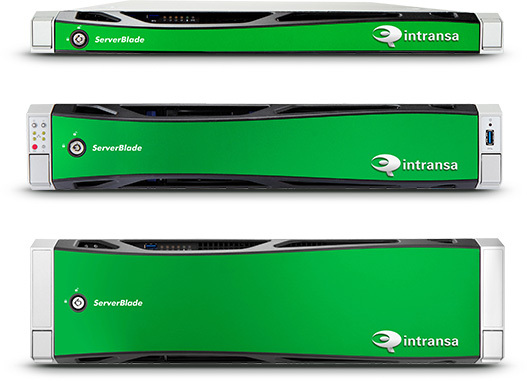 The Intransa ServerBlade series packs 6 servers in 2U or 12 servers in 3U saving space and reducing cost. The Intransa Technology Labs test and certify cameras, VMS systems, NVRs and other applications for use with Intransa VideoAppliance for physical security’s real-world demanding requirements. This allows for risk-free integration, without the complications of products that are not designed for the demands of physical security.